Hi, me too, I can’t do anything. The New Project button is not working. Webpage isn’t even showing a link associated with it. Please help! We’re experiencing problems on parts of the production system (see this thread). The infrastructure team is looking into it! Excuse the lost productivity! We’ll update once the problem is fixed! I’m still stuck with the misplaced and rotated wing. It appears that you both have been really busy with questions on this assignment - have you made any progress with my problem? Would it make sense to pick up another persons model geometry at this time since it doesn’t look like there is a solution for my problem. Hopefully, we all can get an extension for submission because of these issues. Can you have someone advise us [email?] when SimScale system is back in operation. I can’t upload model to simscale, is it in cause it’s heavy (72MB) or in cause of simscale problems? I can not upload my model. I don’t know how to fix it. I have done everything step by step. Will there be any extension to submission of homework? Request permission from Mr/Ms Kowalski to use their model for my simulation to meet the homework requirements for session 4.
i have the same Problem. I can’t extract the .zip folder with the Geometry of the Car. Does Anyone know how to fix that? I have a problem with my simulation. It is a problem others had too but I don’t know how they fixed it. Could someone tell me how i can fix that? Thank you - It is always proper to ask permission to use others work. Also got this message - though curiously it’s the front and rear wheel zones that give errors for me. The error caused the meshing to stop so I can’t continue. 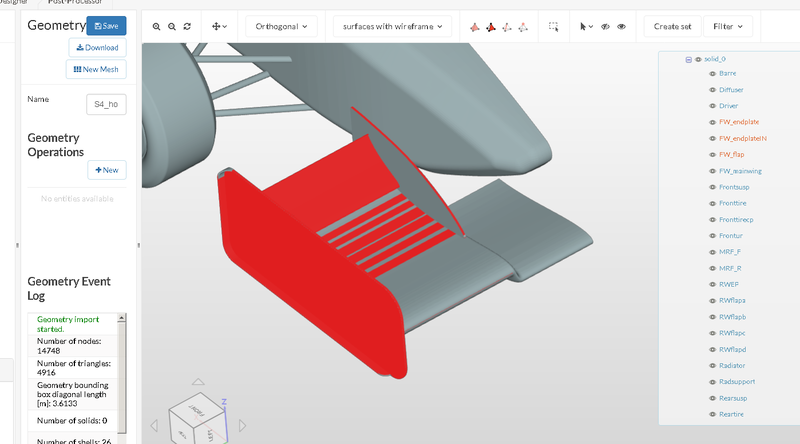 For all of you who use Solidworks as CAD software and have trouble with placing the wing I have a few tips for you (in this way I succed to manage to problem) So the error is started from the model that we received, it’s have a strange orientation and if you you do as orientation Top-Front-Right will be not so good. Also thank you SImScale and stuff for support and this great opportunity. You really builded a big comunity here. Now, I’m out of topic again, hahaha. See you guys , hope that solution it will work ! I had some problems with the stl file. Finally I scaled the wing but is so late to submit my homework on time. Could I submit it one hour later from the deadline? Me again, anyone having trouble with functionality of the wing in the Workbench ? I imported the geometry and firt time was an error , I check and on solidworks was everything ok , upload again , no errors but the functionality is not ok. I will let a picture to show what I mean about that. Anyone had something like this before ?